I know exactly how Ronald Reagan must have felt back in 1980 when he famously said “There you go again” to Jimmy Carter during their debate. Reuters regurgitated this misleading trope about the Laffer Curve last year, issuing a report about how the head of the Congressional Budget Office supposedly disappointed “devotees” of “Reaganomics” by saying that tax cuts are not self-financing. The…Republican-appointed director of the Congressional Budget Office delivered some bad news…to the party’s “Reaganomics” devotees: Tax cuts don’t pay for themselves through turbocharged economic growth. Keith Hall, who served as an economic adviser to former President George W. Bush, made the pronouncement… “No, the evidence is that tax cuts do not pay for themselves,” Hall said in response to a reporter’s question. “And our models that we’re doing, our macroeconomic effects, show that.” His comment is at odds with lingering economic theory from the 1980s. Well, I’m a “devotee of Reaganomics.” So was I disappointed? Nope. I largely agree with the CBO Director on this topic. But I think he should have included two caveats. First, while there are some politicians (both now and also back in the 1980s) who blindly act as if all tax cuts are self-financing, Reaganomics was not based on that notion. Instead, proponents of the Reagan tax cuts simply argued reforms would lead to more growth – and therefore more taxable income. And, on that basis, it was a slam-dunk victory. Interestingly, the report from Reuters quasi-admits that Reaganomics wasn’t based on self-financing tax cuts, noting instead that the core belief was that revenue generated by additional growth would result in “less need” (as opposed to “no need”) to find offsetting budget cuts. Stronger economic growth generated by tax cuts would boost revenues so much that there is less need to find offsetting savings. The second caveat is that not all tax cuts (or tax increases) are created equal. Some changes in tax policy have big effects on incentives to work, save, and invest. Others don’t have much impact on economic activity because the tax system’s penalty on productive behavior isn’t altered. In a few cases, it actually is possible for a tax cut to be self-financing. But in the vast majority of cases, the real issue is the degree to which there is some amount of revenue feedback. In other words, the discussion should focus on the extent to which the foregone revenue from lower tax rates is offset by revenue gains from increased taxable income. Let’s now look at a real-world example from Sweden to see how politicians are blind to this common-sense insight. The left-wing coalition government in that country indirectly increased marginal tax rates (by phasing out a credit) for some high-income taxpayers this year. The experts at Timbro have examined the potential revenue impact. They start with a description of what happened to policy. To finance their reforms, …the marginal tax rate for some 400,000 people working in Sweden – e g doctors, engineers, accountants/auditors and others in high income brackets – will be increased by three percentage points to 60 per cent. …it is also necessary to take into consideration payroll tax… Under current rules, the effective marginal tax rate is 75 per cent for high earners. After the phase-out it rises to 77 per cent. Amazingly, the Swedish government assumes that taxpayers won’t change their behavior in reaction to this high marginal tax rate. Decades of economics research show that if you raise income tax, people will reduce their working time, put in less effort on the job and engage in more tax planning. When the government calculated the expected increase in revenue of SEK 2.7 billion from the earned income tax credit’s phase out, it failed to take changes in behaviour into consideration because revenue and expenses in the budget are calculated statically. The folks at Timbro explain what likely will happen as upper-income taxpayers respond to the higher marginal tax rate. The amount of revenue generated from a tax hike depends on how people change their behaviour as a result. … High elasticity means that salary earners are sensitive to changes in taxation, and that they are very likely to alter their behaviour with certain types of reforms. Examples of this are increasing or decreasing hours worked, switching jobs, or starting a company to enable more tax-planning options. …Elasticity of 0.3 is often used in international literature (e g Hendren, 2014) as a reasonable estimate of the mainstream for this area of research. Piketty & Saez (2012) state that most estimates of elasticity are within the range of 0.1 and 0.4. They conclude that 0.25 is “a realistic mid-range estimate” of elasticity. 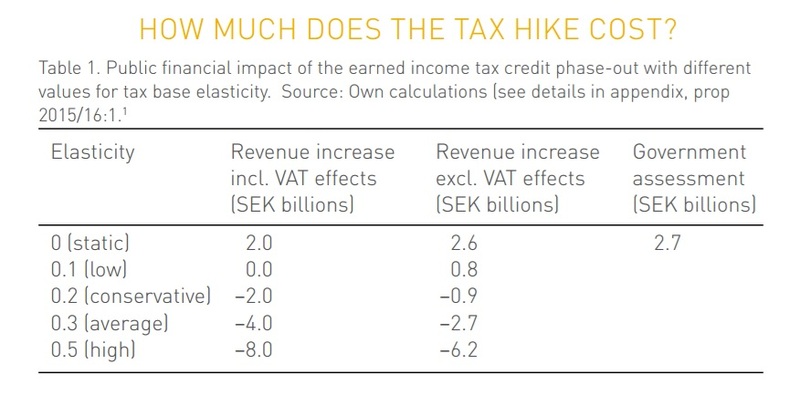 So what happens when you apply these measures of taxpayer responsiveness to the Swedish tax hike? With zero elasticity, i e a static assessment, the revenue increase from phase-out of the earned income tax is assessed at SEK 2.6 billion. That is in line with the government’s estimate of SEK 2.7 billion. … all revenue disappears already at a low, 0.1, level of elasticity. And when you look at the more mainstream measures of taxpayer responsiveness, the net effect of the government’s tax hike is that the Swedish Treasury will have less revenue. In other words, this is one of those rare examples of taxable income changing by enough to swamp the impact of the change in the marginal tax rate. And since we’re dealing with turbo-charged examples of the Laffer Curve, let’s look at what my colleague Alan Reynolds shared about the “huge across-the-board increase in marginal tax rates…Herbert Hoover pushed for” in the early 1930s. Total federal revenues fell dramatically to less than $2 billion in 1932 and 1933 – after all tax rates had been at least doubled and the top rate raised from 25% to 63%. That was a sharp decline from revenues of $3.1 billion in 1931 and more than $4 billion in 1930, when the top tax was just 25%. …Revenues fell even as a share of falling GDP – from 4.1% in 1930 and 3.7% in 1931 to 2.8% in 1932 (the first year of the Hoover tax increase) and 3.4% in 1933. That illusory 1932-33 “increase” was entirely due to less GDP, not more revenue. 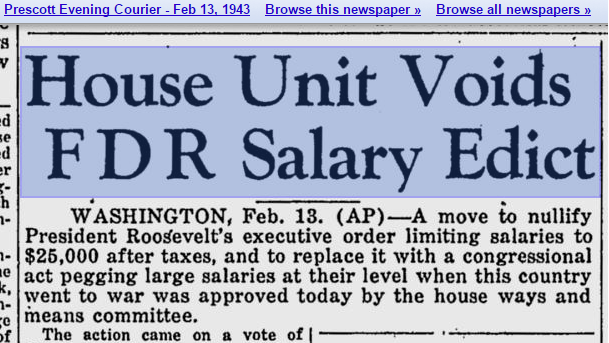 Roosevelt’s additional tax increases in the mid-1930s didn’t work much better. The 15 highest tax rates were increased again in 1936, dividends were made fully taxable at those higher rates, and both corporate and capital gains tax rates were also increased… Yet all of those massive “tax increases”…failed to bring as much revenue in 1936 as was collected with much lower tax rates in 1930. The point of these examples is not that governments wound up with less money. What matters is that politicians destroyed private-sector output as a consequence of more punitive tax policy. And that’s why the tax increases that generate more tax revenue are almost as misguided as the ones that lose revenue. Consider Hillary Clinton’s tax-hike plan. The Tax Foundation crunched the numbers and concluded it would generate more revenue for the federal government. But I argued that shouldn’t matter. …she’s willing to lower our incomes by 0.80 percent to increase the government’s take by 0.46 percent. A good deal for her and her cronies, but bad for America. 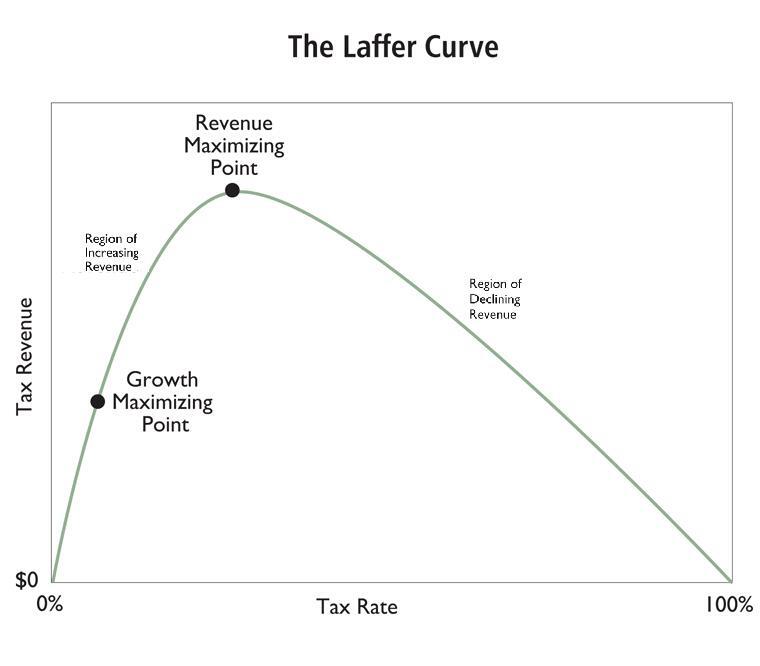 At the risk of repeating myself, we shouldn’t try to be at the revenue-maximizing point of the Laffer Curve. Who is the worst President in U.S. history? No, regardless of polling data, the answer is not Barack Obama. Or even Jimmy Carter. Those guys are amateurs. At the bottom of the list is probably Woodrow Wilson, who gave us both the income tax and the Federal Reserve. And he was a disgusting racist as well. However, Wilson has some strong competition from Franklin Delano Roosevelt, who advocated and implemented policies that exacerbated the bad policies of Herbert Hoover and thus deepened and lengthened the Great Depression. Today we’re going to look at a new example of FDR’s destructive statism. Something so malicious that he may actually beat Wilson for the prize of being America’s most worst Chief Executive. Wilson, after all, may have given us the income tax. But Roosevelt actually proposed a top tax rate of 99.5 percent and then tried to impose a 100 percent tax rate via executive order! He was the American version of Francois Hollande. These excerpts, from an article by Professor Burton Folsom of Hillsdale College, tell you everything you need to know. Note that FDR also began the odious practice of using the IRS as a political weapon, something that tragically still happens today. For more detail about Roosevelt’s confiscatory tax policy, here are some blurbs from a 2011 CBS News report. When bombers struck on December 7, 1941, taxes were already high by historical standards. There were a dizzying 32 different tax brackets, starting at 10% and topping out at 79% on incomes over $1 million, 80% on incomes over $2 million, and 81% on income over $5 million. In April 1942, just a few short months after the attack, President Roosevelt proposed a 100% top rate. At a time of “grave national danger,” he argued, “no American citizen ought to have a net income, after he has paid his taxes, of more than $25,000 a year.” (That’s roughly $300,000 in today’s dollars). Roosevelt never got his 100% rate. However, the Revenue Act of 1942 raised top rates to 88% on incomes over $200,000. By 1944, the bottom rate had more than doubled to 23%, and the top rate reached an all-time high of 94%. 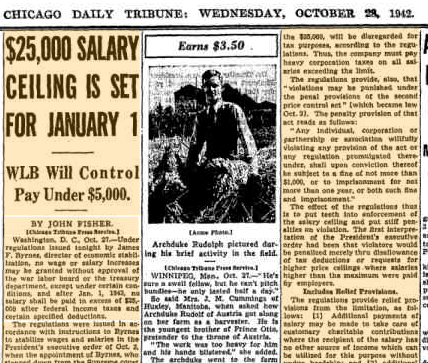 And here are some excerpts from a column that sympathized with FDR’s money grab. FDR proposed a 100 percent top tax rate. …Roosevelt told Congress in April 1942, “no American citizen ought to have a net income, after he has paid his taxes, of more than $25,000 a year.” That would be about $350,000 in today’s dollars. …lawmakers would quickly reject FDR’s plan. Four months later, Roosevelt tried again. He repeated his $25,000 “supertax” income cap call in his Labor Day message. Congress shrugged that request off, too. FDR still didn’t back down. In early October, he issued an executive order that limited top corporate salaries to $25,000 after taxes. The move would “provide for greater equality in contributing to the war effort,” Roosevelt declared. …lawmakers…ended up attaching a rider repealing the order to a bill… FDR tried and failed to get that rider axed, then let the bill with it become law without his signature. Regarding FDR’s infamous executive order, here are the relevant passages. In order to correct gross inequities…, the Director is authorized to take the necessary action, and to issue the appropriate regulations, so that, insofar as practicable no salary shall be authorized under Title III, Section 4, to the extent that it exceeds $25,000 after the payment of taxes allocable to the sum in excess of $25,000. And from the archives at the University of California Santa Barbara, here is what FDR wrote when Congress used a debt limit vote to slightly scale back the 100 percent tax rate. First, from a letter on February 6, 1943. …there is a proposal before the Ways and Means Committee to amend the Public Debt Bill by adding a provision which in effect would nullify the Executive Order issued by me under the Act of Oct. 2, 1942 (price and wage control), limiting salaries to $25,000 net after taxes. …It is my earnest hope that the Public Debt Bill can be passed without the addition of amendments not related to the subject matter of the bill. And here are excerpts from another letter from FDR later that month. When the Act of October 2, 1942, was passed, it authorized me to adjust wages or salaries whenever I found it necessary “to correct gross inequities…” Pursuant to this authority, I issued an Executive Order in which, among other things, it was provided that in order to correct gross inequities and to provide for greater equality in contributing to the war effort no salary should be authorized to the extent that it exceeds $25,000 net after the payment of taxes. Even though Congress was overwhelmingly controlled by Democrats, there was resistance to FDR’s plan to confiscate all income. So Roosevelt had a back-up plan. If the Congress does not approve the recommendation submitted by the Treasury last June that a flat 100 percent supertax be imposed on such excess incomes, then I hope the Congress will provide a minimum tax of 50 percent, with steeply graduated rates as high as 90 percent. …If taxes are levied which substantially accomplish the purpose I have indicated, either in a separate bill or in the general revenue bill you are considering, I shall immediately rescind the section of the Executive Order in question. And, sadly, Congress did approve much higher tax rates, not only on the so-called rich, but also on ordinary taxpayers. Indeed, this was early evidence that tax hikes on the rich basically serve as a precedent for higher burdens on the middle class, something that bears keeping in mind when considering the tax plans of Bernie Sanders and Hillary Clinton (or, tongue in cheek, the Barack Obama flat tax). Let’s close by considering why FDR pushed a confiscatory tax rate. Unlike modern leftists, he did have the excuse of fighting World War II. But if that was his main goal, surely it was a mistake to push the top tax rate far beyond the revenue-maximizing level. That hurt the economy and resulted in less money to fight Nazi Germany and Imperial Japan. So what motivated Roosevelt? According to Burton and Anita Folsom, it was all about class warfare. Why “soak the rich” for 100 percent of their income (more or less) when they already face rates of 90 percent in both income and corporate taxes? He knew that rich people would shelter their income in foreign investments, tax-exempt bonds, or collectibles if tax rates were confiscatory. In fact, he saw it happen during his early New Deal years. When he raised the top rate to 79 percent in 1935, the revenue into the federal government from income taxes that year was less than half of what it was six years earlier when the top rate was 24 percent. …First, FDR, as a progressive, believed…that “swollen fortunes” needed to be taxed at punitive rates to redistribute wealth. In fact, as we can see, redistributing wealth was more important to FDR than increasing it. …Second, high taxes on the rich provided excellent cover for his having made the income tax a mass tax. How could a steelworker in Pittsburgh, for example, refuse to pay a new 24 percent tax when his rich factory owner had to pay more than 90 percent? Third, and possibly most important, class warfare was the major campaign strategy for FDR during his whole presidency. He believed he won votes when he attacked the rich. In other words, FDR’s goal was fomenting resentment rather than collecting revenue. And there are leftists today who still have that attitude. Heck, there’s an entire political party with that mentality. Does “Freedom” Mean an Entitlement to Other People’s Money? Maybe the warm weather is affecting my judgement, but I’m finding myself in the odd position of admiring some folks on the left for their honesty. A few days ago, for instance, I (sort of) applauded Matthew Yglesias for openly admitting that punitive tax rates would put us on the downward-sloping portion of the Laffer Curve. He still favors such a policy, which is very bizarre, but at least his approach is much more honest than other statists who want us to believe that very high tax rates generate more revenue. Today, I’m going to indirectly give kudos to another leftist. Writing for the Washington Post, Katrina vanden Heuvel openly argues that the meaning of freedom should be changed. Here’s some of her argument, and we’ll start with her reasonably fair description of how freedom currently is interpreted. For conservatives, freedom is centered in markets, free from government interference. …Government is the threat; the best thing it can do is to get out of the way. …freedom entails privatization, deregulation, limiting government’s reach and capacity. Needless to say, I agree with this definition. After all, isn’t freedom just another way of saying “the absence of coercive constraint on the individual”? Heck, this is why I’m a libertarian. Sure, I like the fact that liberty produces more prosperity, but my main goal it to eliminate needless government coercion. But I’m digressing. Let’s get back to her column. She complains that folks on the left have acquiesced to this traditional conception of freedom. Democrats chose to tack to these conservative winds. Bill Clinton’s New Democrats echoed the themes rather than challenge them. “The era of big government is over,” he told Americans, while celebrating “ending welfare as we know it,” deregulation of Wall Street… Obama chose consciously not to challenge the conservative limits on what freedom means. Then she gets to her main argument. She wants Hillary Clinton to lead an effort to redefine the meaning of freedom. This is Hillary Clinton’s historic opportunity. …She would do a great service for the country — and for her own political prospects — by offering a far more expansive American view of what freedom requires, and what threatens it. …expanding freedom from want by lifting the floor under workers, insuring every child a healthy start, providing free public education from pre-k to college, rebuilding the United States and putting people to work… Will she favor fair taxes on the rich and corporations to rebuild the United States and put people to work? Will she make the case for vital public investments — in new energy, in infrastructure, in education and training — that have been starved for too long? Will she call for breaking up banks…? Will she favor expanding social security…? …to offer Americans a bolder conception of freedom…and set up the debate that America must decide. Needless to say, I strongly disagree with such policies. How can “freedom” be based on having entitlements to other people’s money?!? Heck, it’s almost like slavery since it presupposes that a “right” to live off the labor of others. But that’s not technically true since presumably there wouldn’t be any requirement to work. 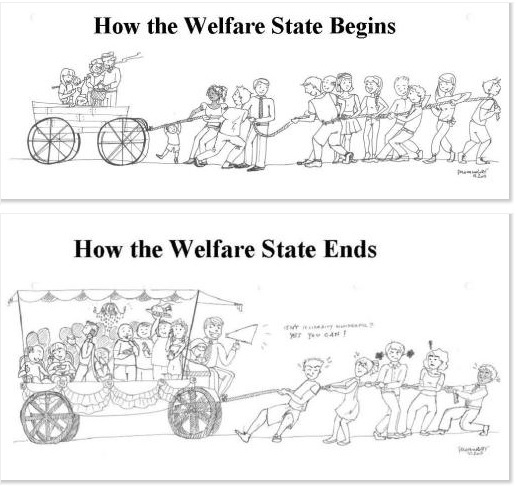 So what would really happen in such a society is that people would conclude it’s better to ride in the wagon of government dependency, as illustrated by these cartoons. Which means, sooner or later, a Greek-style collapse because a shrinking population of producers can’t keep pace with an ever-expanding population of moochers and looters. Nonetheless, I give Ms. vanden Heuvel credit for acknowledging that her preferred policies are contrary to the traditional definition of freedom. To be sure, I’d admire her even more if she simply admitted that she favors government coercion over freedom. That would be true honesty, but I can understand that folks on the left would prefer to change the meaning of words rather than admit what their agenda really implies. P.S. Some of you may recognize that the issues discussed above are basically a rehash of the debate between advocates of “negative liberty” and supporters of “positive liberty.” The former is focused on protecting people from the predations of government while the latter is about somehow guaranteeing goodies from the government. P.P.S. As mentioned in Ms. vanden Heuvel’s column, today’s effort to redefine freedom is similar to the so-called economic bill of rights peddled in the 1940s by FDR. FDR did not get us out of the Great Depression—not during the 1930s, and only in a limited sense during World War II. Let’s start with the New Deal. Its various alphabet-soup agencies—the WPA, AAA, NRA and even the TVA (Tennessee Valley Authority)—failed to create sustainable jobs. In May 1939, U.S. unemployment still exceeded 20%. European countries, according to a League of Nations survey, averaged only about 12% in 1938. The New Deal, by forcing taxes up and discouraging entrepreneurs from investing, probably did more harm than good. …His key advisers were frantic at the possibility of the Great Depression’s return when the war ended and the soldiers came home. The president believed a New Deal revival was the answer—and on Oct. 28, 1944, about six months before his death, he spelled out his vision for a postwar America. It included government-subsidized housing, federal involvement in health care, more TVA projects, and the “right to a useful and remunerative job” provided by the federal government if necessary. Roosevelt died before the war ended and before he could implement his New Deal revival. His successor, Harry Truman, in a 16,000 word message on Sept. 6, 1945, urged Congress to enact FDR’s ideas as the best way to achieve full employment after the war. Congress—both chambers with Democratic majorities—responded by just saying “no.” No to the whole New Deal revival: no federal program for health care, no full-employment act, only limited federal housing, and no increase in minimum wage or Social Security benefits. Instead, Congress reduced taxes. Income tax rates were cut across the board. …Corporate tax rates were trimmed and FDR’s “excess profits” tax was repealed, which meant that top marginal corporate tax rates effectively went to 38% from 90% after 1945. Georgia Sen. Walter George, chairman of the Senate Finance Committee, defended the Revenue Act of 1945 with arguments that today we would call “supply-side economics.” If the tax bill “has the effect which it is hoped it will have,” George said, “it will so stimulate the expansion of business as to bring in a greater total revenue.” He was prophetic. By the late 1940s, a revived economy was generating more annual federal revenue than the U.S. had received during the war years, when tax rates were higher. Price controls from the war were also eliminated by the end of 1946. …Congress substituted the tonic of freedom for FDR’s New Deal revival and the American economy recovered well. Unemployment, which had been in double digits throughout the 1930s, was only 3.9% in 1946 and, except for a couple of short recessions, remained in that range for the next decade.